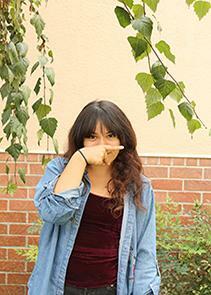 In her free time, the 16-year-old introvert enjoys going on the in­ternet, writing­­ poetry, and playing Mario Kart. Musically, Gallardo’s tastes range from 80s-nostalgic tunes by The Smiths and The Cure to more modern alternative jams by Mac Demarco and Tame Impala. In the future, the writer sees herself attending a university somewhere in Northern California, where she wants to either continue her writing career or become a preschool teacher. But for now, she enters her second year with unassailable high hopes and a bright future­.